Fulvia is most familiar as the wife of Mark Antony, but that label does not do her justice. Antony was her third husband and, by the time they married in 44 BC, she was already a well-known figure in Roman public life. In fact, her political clout may have been almost as much of an attraction to Antony as her money. The wealth she inherited as the last surviving member of two ancient families; the clout came largely from her previous marriage to Publius Clodius Pulcher – and from Fulvia’s shrewdness in exploiting that connection. This was during the Roman civil wars, a dangerous time to be in politics. Clodius was a ruthless and successful politician who, despite coming from the upper class, courted the support of the common people. His feud with Titus Annius Milo, who belonged to the more pro-aristocratic faction, was played out in the law courts and in the streets with gangs of hired thugs. A clash between the two ended with Clodius dead and Milo on trial for his murder. Fulvia had been an unusually close and attentive wife during their marriage, interested in Clodius’ career and accompanying him on journeys, but it was after his death that she came into her own. 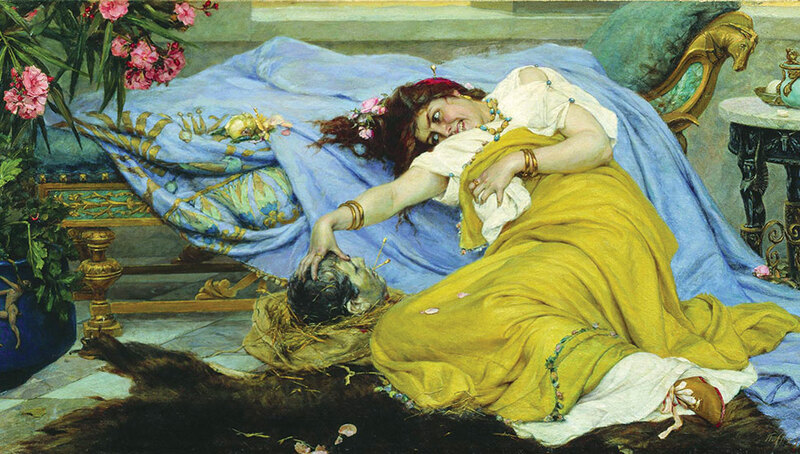 She sparked a riot by having Clodius’ wounded body dragged into the street in Rome to rouse the sympathy of the common people for their fallen champion and for his bereaved family. She and her mother gave evidence at Milo’s trial – the last of the witnesses to speak, a mark of significance. Her very public grief strengthened Clodius’ faction and weakened Milo’s. But this grief did not prevent her from marrying again, almost as soon as the prescribed mourning period had ended. Her second husband was Gaius Scribonius Curio, a promising politician near the start of his career. He instantly became a lot more promising, switching from the aristocratic to the popular faction and showing a decisiveness and purpose of mind that had previously been lacking. Although her role was not publicly acknowledged, Fulvia’s influence was clear. Curio died on military service in Africa only a couple of years later and Fulvia married Mark Antony, with whom (according to rumours spread by the orator Cicero) she had been sexually involved while she was still married to Clodius. Antony was young, ambitious and close to Julius Caesar, but he lacked self-control and decisiveness – qualities that Fulvia could supply. Her effect on Antony’s career was just as pronounced as it had been on Curio’s. She was also involved in the less savoury parts of Antony’s career. Years later her detractors would gleefully pass on the rumour that after Cicero, a fierce critic of Antony, had been killed during the bloodbath of proscriptions, Fulvia repeatedly stabbed the dead man’s tongue with a hairpin. But Fulvia was not content with a supporting role. The biographer Plutarch described her as a woman who wanted to ‘rule a ruler and command a commander’. The historian Cassius Dio remarked that ‘the following year [41 BC] Publius Servilius and Lucius Antonius nominally became consuls, but in reality it was Antonius and Fulvia’. That was the year in which, enraged by Octavian’s attempts to rob Antony of the credit for their joint actions, she started a war against the man who would become the first Roman emperor. This, the Perusine War, is what Fulvia ought to be remembered for, rather than as someone’s wife. Whether she had Antony’s backing or not (something he later denied), she was the driving force in the attempt to wrest power from Octavian – later Augustus Caesar. Coins from the time, with her image on them in the form of a winged Victory, show how serious this bid was; Fulvia was the first living woman ever to have her face on Roman coinage. The only other people putting their faces on Roman coins at this time were the triumvirs Octavian, Antony and Lepidus – the three rulers of Rome. Fulvia and her brother-in-law, Lucius, gathered military forces and seized the towns of Perusia (modern Perugia) and Praeneste (Palestrina). Fulvia’s role as the fomenter of the conflict was openly recognised at the time; when Octavian’s forces besieged Perusia, they inscribed the missiles they launched into the town with personal insults directed at her. Octavian finally succeeded in taking the town, but he spared the lives of the wife and brother of Antony, with whom he was still ostensibly in alliance. Fulvia was not daunted; she travelled to Greece, where Antony was stationed, to persuade him to sail on Italy. Antony was reportedly furious with Fulvia over her actions in Italy, but her arguments were compelling: Rome was already divided and the leaders of two large naval forces stood prepared to back Antony against Octavian. The final showdown between Octavian and Antony would have come ten years sooner, and might have ended differently, if Fulvia had not succumbed to illness and died suddenly in 40 BC. She was probably in her early forties. Antony was facing Octavian’s forces at Brundisium (Brindisi) when he received the news. He saw an easier way out and took it: the men agreed to blame Fulvia for the entire affair and their fragile alliance survived. Antony would return to the east and to Cleopatra; Octavian would have total control over Italy. It seems safe to assume that Fulvia, had she lived, would not have been tempted by this easy fudge. She was a courageous woman, more at home in a military camp than behind a spinning wheel. Although she was insulted as ‘unwomanly’ for her political activities, even her detractors had to admit she was a force to be reckoned with. More than just somebody’s wife, somebody’s daughter, somebody’s sister, Fulvia was the unofficial fourth member of the Triumvirate, who very nearly changed the course of Roman history. Karen Murdarasi writes on Ancient History and Robin Hood.